The Famous Writers School was co-founded by Bennett Cerf, who also co-founded Random House, the publishing company. The Wikipedia entry for FWS is here; the exposé by Jessica Mitford is here. It was fronted by various (at the time) well known names from the world of publishing, such as Rod Serling. Talent is innate. No one can teach it to you. You can be taught how to use tools and how to operate within the market where the fruits of your talent can be sold. Otherwise, you’re on your own. I am suspicious of any course purporting to teach “creative writing”. The student’s time and money would be better spent in (a) living life and thereby furnishing his subconscious with the stuff of which stories are made; and (b) reading, reading, and reading some more, thereby furnishing his mind and sensibility with the stuff from which his own technique can be wrought. A former neighbour of mine once approached me as I was washing my car. She said that a friend of hers had fallen on hard times and needed some quick cash. This friend had had the idea of writing a novel. Did I have any tips; could I recommend any shortcuts? 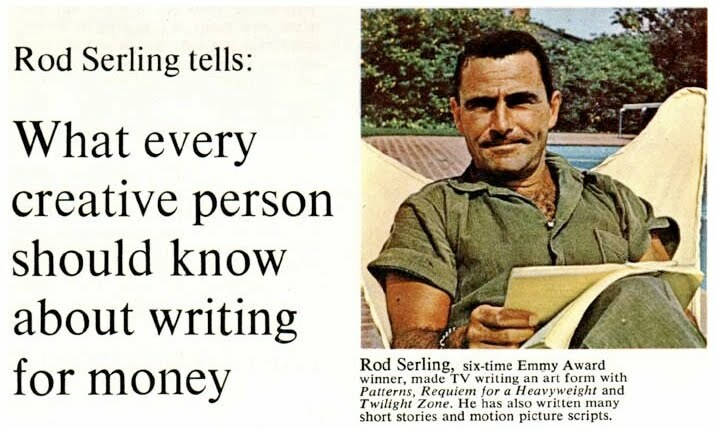 No one with an ounce of sense sets out to write for money. In fact, no one with an ounce of sense sets out to write at all. One writes because one is compelled to do so; because failure to write, to get the words out, results in a malaise that cannot be relieved in any other way. Writing is a form of addiction. The writer craves the opioids that his own brain generates during composition. The habit often begins early, at school, with praise from a teacher for an essay or poem. The confounded teacher notices a spark of talent in the wretched child and with unthinking words at once sprays butane on the embers and condemns the pupil to a lifetime of addiction. Of course, the dopamine habit also grips the untalented, as a glance at any slush-pile, paper or electronic, will confirm. If you write “creatively” at all, the only valid motive is self-realization. You should not expect, and certainly not demand, that other people should read your output, still less pay you for it. If they do either, you’re well ahead of the game – especially if they pay. The desire for payment will expose you to rejection on an industrial scale. It will compromise your output. You will have to stifle innovation by tailoring your prose to a presumed “market” (i.e. the work already on sale). You will also have to collaborate and accept criticism, not only from editors but reviewers. But, in the first instance, the desire for payment will leave you vulnerable. The world’s greatest con-artist, “Count” Victor Lustig, once declared that it was impossible to swindle an honest man.